To be practical and useful, gizmos need to be more about fulsome function than just fancy form. “Only for the tech savvy" doesn’t make life easier, but using tech smartly does. In fact, not many users care about how things work as long as they get the job done—especially when it’s travel gizmos you’re talking about. Beyond the iPad, the Kindle, the iPod, the Nikon, the world travel adapter, and the clutch of memory cards, chargers and cables that you’ve tucked into your Victorinox (or Kata) backpack, here are some shrewd contraptions that could make Captain Cook, Christopher Columbus and company eat their compasses out. Do you tend to randomly dump your devices, cables and other accessories into a suitcase whenever you don your Seven-league boots for travel? And then go into a tizzy hunting for an accessory each time it’s required? Furthermore, when you are in your hotel, do you often fume over the dearth of electric sockets to charge your gadgetry? To avoid this, what you need is a cord organizer and charging case. The KangaRoom, for example, gives you multiple pouches for device storage, place holders for chargers as well as a built-in power strip which you can plug into an AC wall socket and juice up several gadgets simultaneously. Thomas Hancock patented his elastic fastenings for gloves, suspenders, shoes and stockings way back in 1820. Little did he know that his invention would one day be the prime ingredient of a unique weave of rubberized criss-crossing elastic bands contrived to hold hi-tech devices firmly in place. Simple, versatile and ingenious, the lightweight gadget and accessories organizer helps you keep everything from cables and connectors to your phone in pecking order and travel in your laptop bag or in a suitcase. Available in various sizes and styles, some models also feature neoprene sleeves at the back to ensconce a laptop and zip pockets to hold smaller contraptions like pen drives and connector tips. You can term it the modern day Hansel-and-Gretel breadcrumb trail machine. Dubbed the world’s smallest GPS tracker, the Trackstick Mini has the prowess to continuously record and store the exact route you explore in ferny forests or urban jungles. Not just that, it registers your stop times, speed of travel, direction, altitude and other locational information. All this can be downloaded and viewed on your laptop in a snap. It comes with a tracking and geo-photo tagging software, and doesn’t require any sort of monthly/annual fees to deploy. The 3.5-inch device is weatherproof, shock resistant and comes with a magnetic mount. It can also be clipped to a belt or placed in a bag. The Trackstick has a built-in USB-chargeable lithium-ion battery. If you’ve ever had to place your smartphone, iPod or camera on the floor for charging at an airport or any public place with swirling crowds, and then spend the next 30 minutes mortified at the thought that some sloppy soul might kick or step on it, you’ll appreciate this uncomplicated gadget “hammock". The sole purpose of this minimalistic, lightweight plastic tray is to hold your expensive gadget up next to the charging socket. It features a small curved carrying platform and a short vertical wall with eye holes for the prongs of the charger. Once the charger is plugged into the wall socket, the tray is secured. As easy as that! The name says it all. Here’s a device that could yank you out of tricky situations—whether you’re camping in the Gir forest in Gujarat or are stuck in Gurgaon, National Capital Region. It could even possibly help you win booty in the Survivor television series—if you can sneak it in, that is. The device functions as a hand-cranked power generator that can charge your mobile phone and MP3 player. It features an in-built bright white LED flashlight, red emergency flashers, sonic security alarm, motion-activated security alarm and FM digital radio—each of which are driven by hand cranking. It comes with cellphone adapter tips as well as a compass and signalling mirror. Heading for a few days of camping into the wilderness, away from civilization, and wondering how you will charge your gadgets without electricity? No, we’re not suggesting an extraordinary solar-charging solution such as the Solio chargers that can store energy for up to a year and recharge from sunlight (or a wall socket when sunlight is not available). Simply pocket a Green Powercell Technology Pvt. Ltd portable battery-charging solution—these come in at least four variants of 2,000-20,000 mAH capacity. Capable of fully replenishing the juice of a discharged iPhone or BlackBerry three-four times, the phone-sized unit comes with several tip adapters to accommodate different devices. 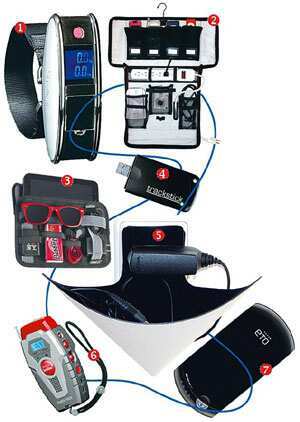 ETÖ also invigorates cameras, camcorders, iPods, MP3s, Bluetooth headsets and portable gaming consoles. The only thing lacking is a little pouch to carry the contraption.